Motivation for this unit has been the Object Name Information Group of the International Guidelines for Museum Object Information: The CIDOC Information Categories and other domain expert knowledge, as well as interpretation of characteristic database schema elements from relevant collection management systems. 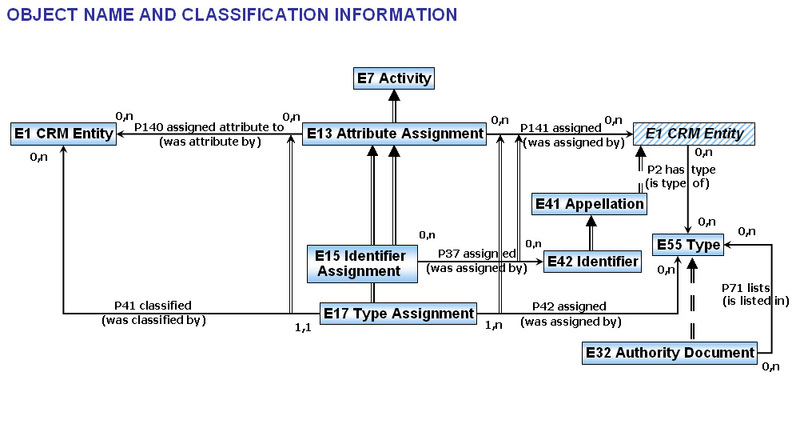 Frequently object names are confused with classification. The CIDOC CRM regards as object name only proper names (such as “Mona Lisa”) and object identifiers. ‘Names’ such as “wine goblet” are indeed classes (E55 Type).